January 19, 2015. Martin Luther King Jr. Day. I woke up this morning and hastened to the computer to post my father’s portrait of Martin Luther King Jr. on all of my various social media accounts. It’s a portrait that became sort of famous in the 1970’s. The only one of my father’s paintings that he ever made reproductions of, so that it could be owned by many. The portrait could be found, in the years that followed its creation, in several city halls throughout the country, other civic buildings, schools, private homes. I even once opened an Ebony Magazine (I was a teen at the time) to an article about an Atlanta attorney. I don’t even remember who the attorney was, as what happened next is the only part of the story that was important to me. There, under the byline, but before the title of the article, was a photograph of the attorney in his Atlanta offices. And there in the background of the photo, hanging on a wall, was my father’s King. It counted as the only example of that kind of experience I’ve ever had regarding my father’s work, since he was an artist who never exhibited, never had reproductions made of his work, save the King, and almost never offered his works for sale. He was a peculiar artist in that way. He’d made his living as a graphic artist for the aerospace industry for his entire life, and so the fine art pieces he did were purely for love and personal reward, or sometimes on commission. All of his children have his works, and many other family members and friends. But otherwise, the King remains the only of his work that circulated the country a bit in its day. Sorry about the tangent. This post is not about “the King,” as we have always called his painting, but I’m a proud daughter, so there you go. And here it is, in its entirety. 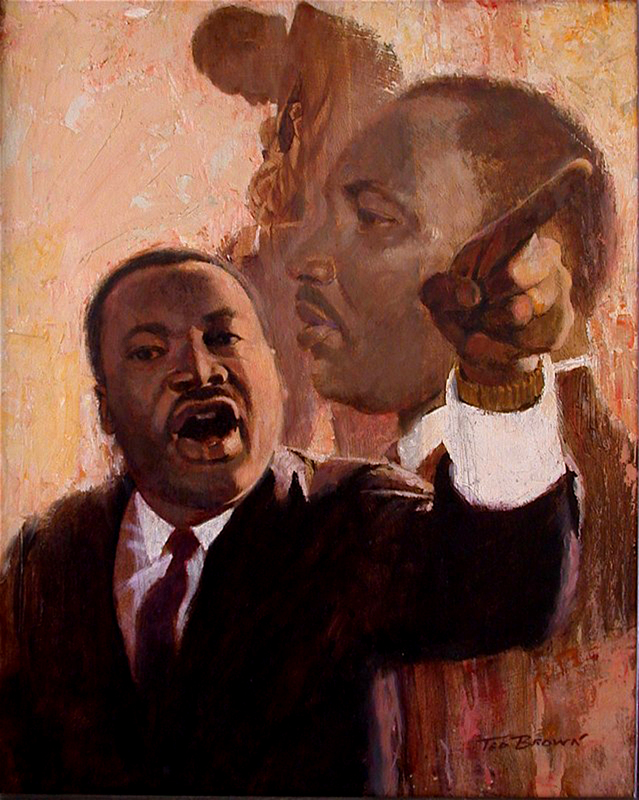 Anyway, I posted my father’s painting on Facebook, Twitter, et al., along with one of my favorite quotations of Dr. King’s, as my contribution to paying tribute to this national holiday of the birth of the Reverend Doctor Martin Luther King, Jr. There are so many of his wonderful quotations that it was hard to choose the one that resonated the most with my heart today. As all great men and women tend to inspire, on any given day a different aspect of Dr. King’s lifework might ring in my heart and the accompanying quotation in my ears. Because the many avenues of his life’s work extend far beyond civil rights and racial equality, as a friend of mine reminded in an email he sent out this morning to a handful of friends. Dr. King also fought for unions, supported labor strikes and better economic realities for the poor of all races, and lastly, but hardly least, he was passionately outspoken against the Viet Nam War, and against war period. I made the post, and then went about the rest of my day, periodically checking back to see if any comments had been made. Isn’t that what we do? The rest of my day consisted of meeting up with friends for lunch and a bit of business, then working on some graphic jobs for clients, and then taking the afternoon to go see a movie, as this is the time of year that I and my ilk (a small circle of us) log in the requisite Oscar nominees. It’s our favorite time of year. I’ve seen some pretty wonderful movies this season, and today’s was going to be American Sniper. As I sat through this well-crafted Clint Eastwood film, I found myself physically uncomfortable and fidgety in my seat. I am a movie buff (I guess there’s a range of buffness; so perhaps I’m just a semi-buff). I love movies for their honesty, their irony, their in-depth character study, and their unsentimentality. Just tell a story, and let the story, itself, do its job to move us, or anger us, or teach us, or make our hearts soar, or make us laugh, or confound us, or take us to the couch. I woke up this morning with Dr. King firstly on my mind. I woke up with his many, many words of great inspiration swimming in my head, because I am on his side in these matters. I do not believe in war. I’m sure my politically conservative friends and my military friends will have their issue with me on that. That’s for us to work out. But I can appreciate a depiction of war, which is why I was sitting in a movie theater this afternoon, seeing this film. It’s the juxtaposition of having chosen this day to go, which didn’t even dawn on me until I was in it and committed, and which was most definitely the source of my restlessness, that puzzles me. What I found most poignant and most troublesome wasn’t even in the film itself (though I did find the film itself gravely problematic), but the audience’s various reactions throughout. There was hearty laughter when killings happened. Silly, immature laughter. There was universal jingoistic applause when a tension-moment in the movie ended in enemy-slaughter at its most brutal. This was the audience from a Rocky movie or a soccer game. Did the filmmakers have that kind of whipped up lust as their intention? Because propaganda, after all, was at the heart of this film, and that’s what propaganda is designed to do. Eastwood’s direct trajectory in the film from 911 to our invasion of Iraq, as though one had anything to do with the other, is why I charge him with propaganda. And yet, before I go any further down the rabbit hole of political polarities, that is not even the component of the film that left me in turmoil. That component I simply, disappointingly, chalked up to the Big Lie. What left me divided, and it’s finally hitting me even as I write this, is that Eastwood, himself, was divided. I don’t believe he really knew what story he wanted to tell. Because while he most assuredly directed a very deliberate go-get-’em piece of patriotic frenzy-whipping, Eastwood also depicted a man wrecked by his experience over there, even as that man lived in denial of his distress. And those were the moments that had a human, thoughtful, nuanced, insightful element to it. Those were the moments that reminded me why I have always championed Eastwood as a director. But while I didn’t need for Chris Kyle to be a redeemed man, or to have some kind of awakening about his actions, it was extremely important for that to be inherent in the narrative, and it just wasn’t. It brought to mind, for me, Paul Schrader’s and Martin Scorsese’s powerful and chilling Taxi Driver. Here is a character so deeply troubled, and unredeemed even to the very end. But though Travis Bickle is never redeemed, his story, his narrative, IS, through its making a comment about society. American Sniper had every opportunity to do just that. And ultimately, because propaganda was allowed to prevail instead, it failed. I am chasing that maturity every single day. On rare days, I even catch the little fucker.